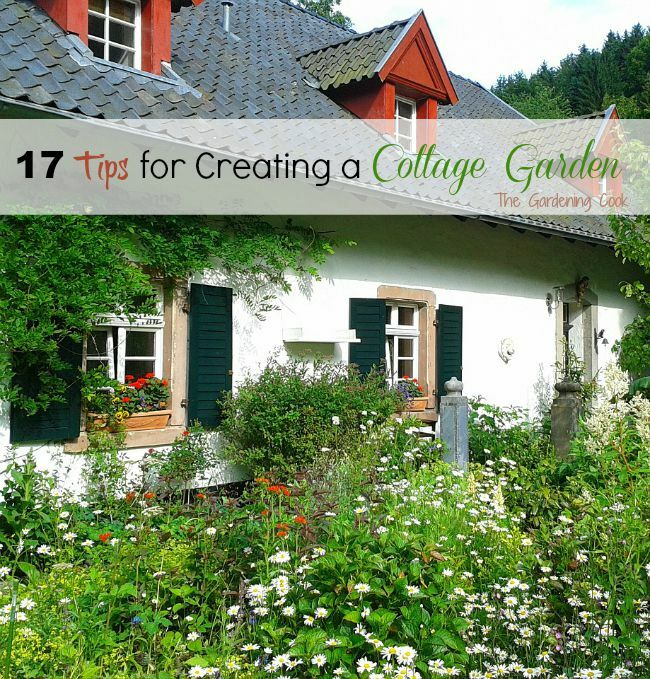 17 tips for creating the perfect cottage garden. I love a cottage garden. I am not a rule follower by nature, especially when it comes to gardens, and I love the way a cottage garden throws caution to the wind in the rule department. Do you like lots of flowers, flowing lines and a not so formal look? Then a cottage garden might be the type for you too. Embrace the Romance of a Cottage Garden. 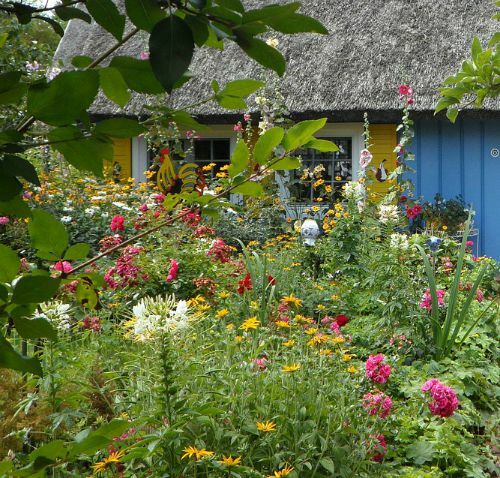 What makes a cottage garden? That is the beauty of it. There really are no rules. Herbs fit in well. Lots of flowers add to the look. Charming sheds, picket fences, hollyhocks and more all can add to the appeal. 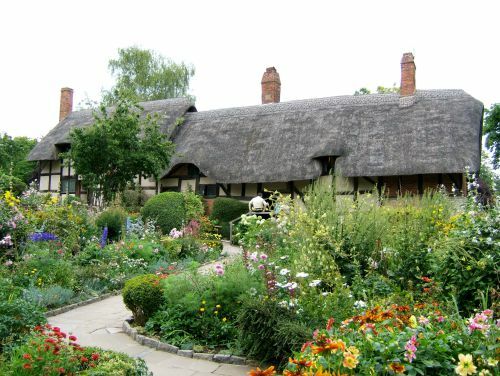 This photo of Anne Hathaway’s Garden in Stratford Upon Avon is a wonderful example of the English cottage Garden. Many people choose pink flowers for cottage gardens, since they have a romantic look to them. 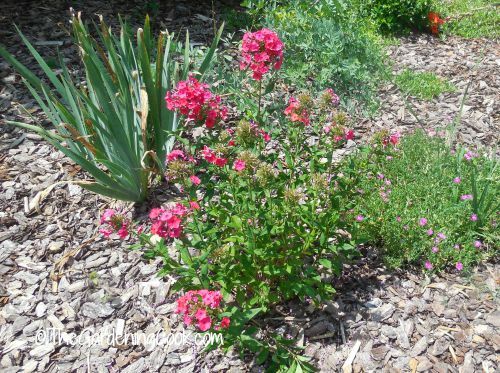 See my list of 15 Pink Flowering plants here. Note: Some of the links in this article are affiliate links. See my full disclosure page here. 1. Use flowing border edges. Many cottage gardens have a curved edge to the garden border. The desired look is relaxed and loose, not rigid and formal. Think about curving your pathways too. 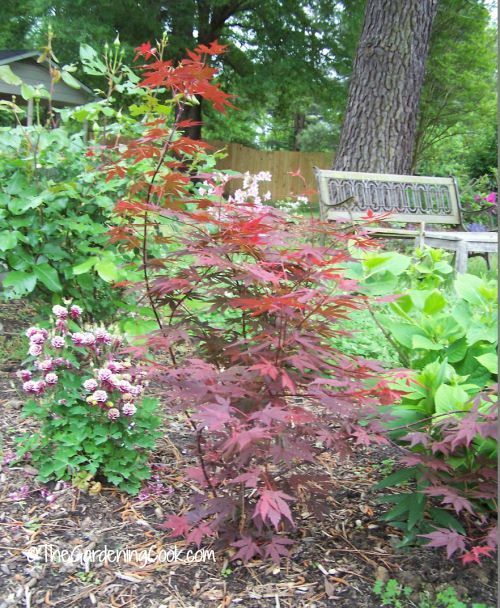 All of these flowing lines add the softness to your garden that you are going for. 2. Allow the plants room to grow. Don’t be afraid of a stray plant outside the edge of the border. Cottage gardens should have the look of the natural English countryside with wild flowers and clumps of native flowers growing here and there, just reaching into the path. 3. Add some charm. A cottage garden says “come in, relax and wander and stay for a while.” Get this feel by adding some charm to your setting. How about a pretty arbor that invites you to wander to the next area? 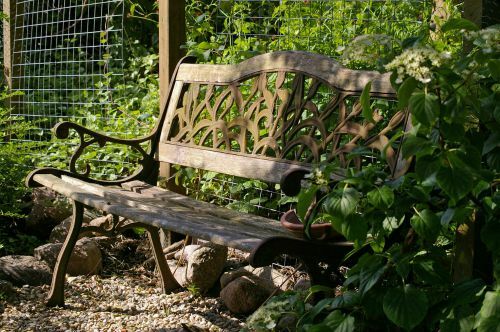 Do you have room for a small seating area that overlooks your garden bed full of color? Let the vines climb up fence posts. Treat your garden like a small child that needs room to roam and have fun! 4. Some order is needed. Just because a cottage garden likes a free flowing effect does not mean that it should be chaotic. A well planned cottage garden is definitely planned from the start to look relaxed. Think ahead about how you want that border and those edges to look. 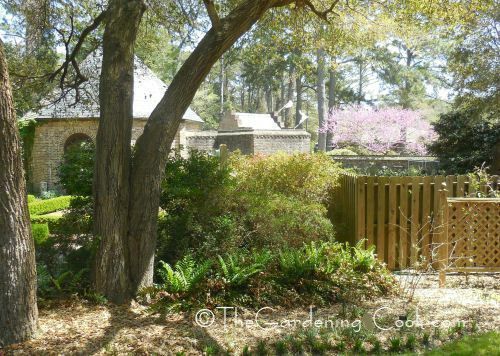 Study photos of cottage gardens online and then plant to achieve that inviting, relaxed look. 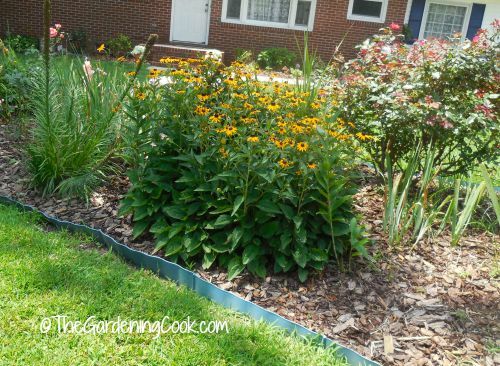 This garden bed has been carefully planned to have the cottage garden look but with plants that will flower all season long. 5. Fences and Gates. 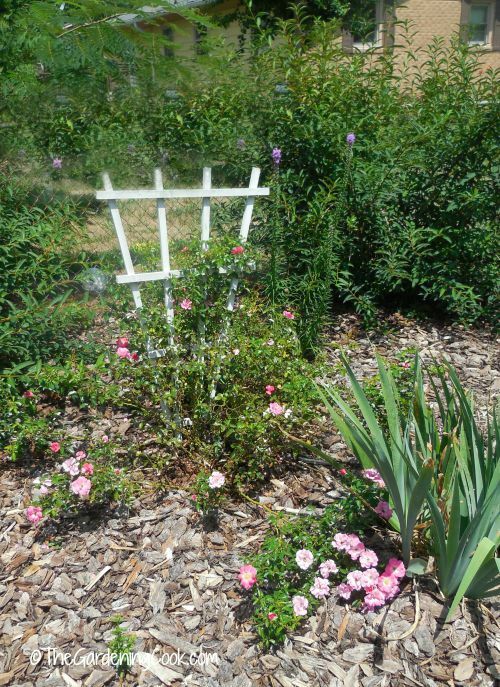 A white picket fence with a pretty gate is found in many cottage gardens. White pickets not your cup of tea? No problem! Any inviting gate or fence will do. Just plant around it to make the fence seem a part of the overall design. The aim it to invite people in by blending the entry to the garden, not to discourage guests by making things too formal. There is a reason people had cups of tea over the fence line! The surroundings make it the perfect place to relax. 6. Old Fashioned Flowers. A cottage garden is not about the latest and greatest new variety. It is planted with tried and true flowers that people have been growing for centuries. Some favorites are peonies, cosmos, foxglove, snapdragon, bleeding heart, and hollyhock. 7. Homey Furniture. The furniture in a cottage garden is comfortable, welcoming and very homey looking. It does not even need to match. The whole look should be informal. This is where a visit to the local flea market helps. A bit of this and a bit of that might be just what you need in a small seating area of your space. Wicker, Adirondack chairs, and wooden chairs all look great in an informal setting. I love using garden benches in my garden beds with plants encroaching on them. It sets a pretty mood. 8. Walkways. A cottage garden is meant to be explored and should have you wondering what is around the next corner. Walkways can make even a small yard seem larger. They break the yard into parts, and add variety to the stroll around the landscape. Informal paths, such as gravel or flagstone create a cottage garden look. Adding arbors on the paths also helps to break up the yard and add to the mystery of it. 9. Vary the height of the plants. Think of the way plants grow in nature. They are definitely not all the same size, and your cottage garden should follow this idea too. 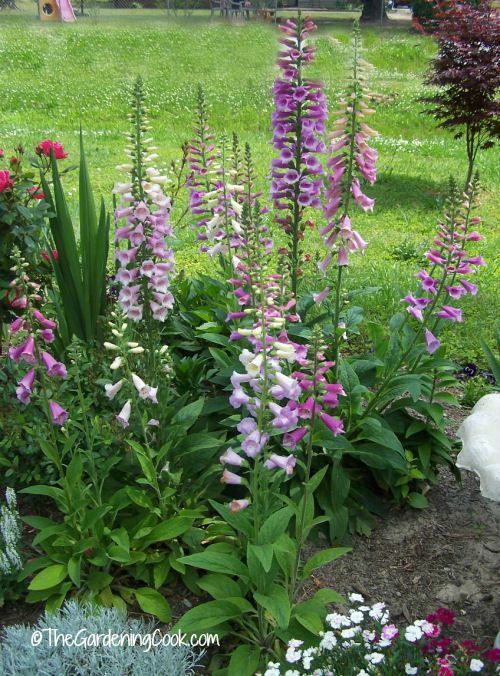 Combine foxglove spires next to clusters of English daisies. Snapdragons, Irises and hollyhocks also add the height that is needed here and there for this look. 10. Add rocks and gravel. 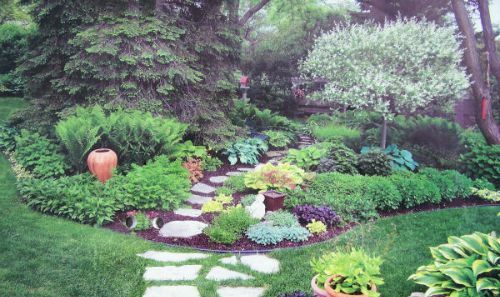 Cottage gardens often have rock walls, stone accent pieces, or slate walkways. Small areas of gravel with some painted metal furniture and flowing plants around could be added. If your yard slopes, consider slate steps. 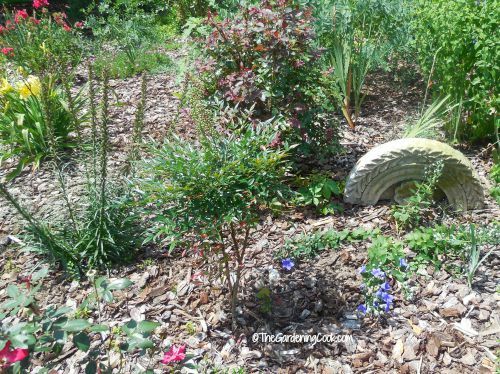 This curved stone accent piece is the perfect addition to this garden bed. 11. Add a charming garden shed. This is one area of the garden where you can go as wild as you like. 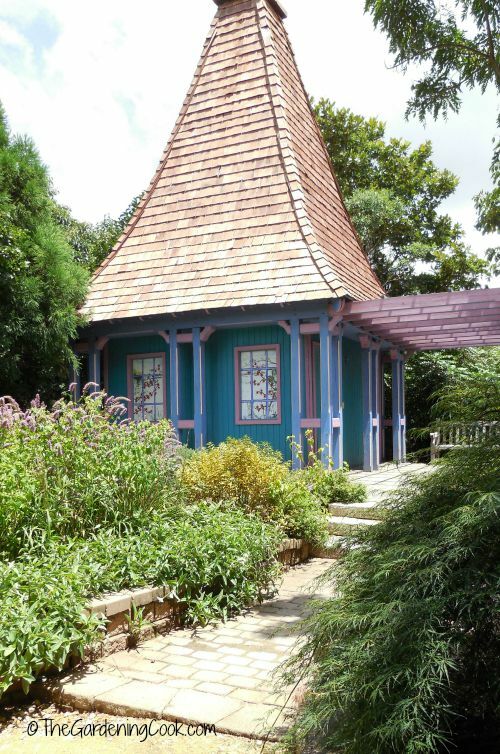 A cute little garden shed in funky colors and some added building decor just can’t go wrong in a cottage garden. I love the gingerbread look for this garden shed. 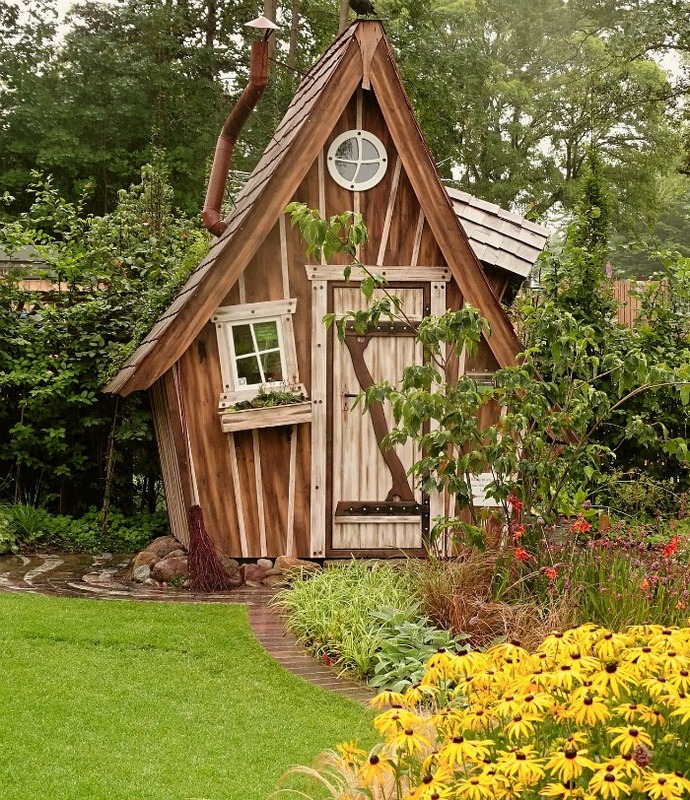 See more garden sheds inspiration here. 12. Incorporate a trellis. A trellisis right at home in any cottage garden. It can be a small one that will help a single rose bush to climb, or a large trellis wall that is covered in vines. They are all perfect. 13. Be whimsical. Add some whirligig butterflies or pinwheels. Paint up some rocks to look like ladybugs. Get out your creative side and go crazy. They will all fit in just fine. 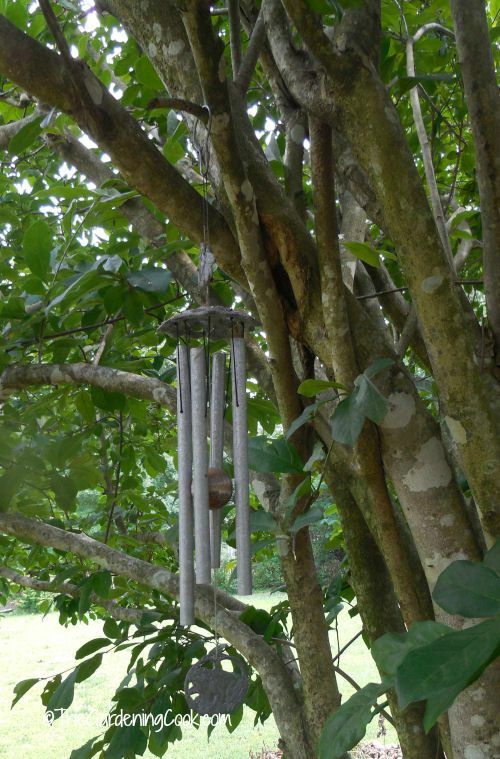 Wind chimes are available in all sorts of styles now. This one is right at home in my cottage garden. 14. Pack your Garden Beds. Cottage gardens have plants very close together as long as they don’t overcrowd each other. This also has the added benefit of keeping the weeds in bay too! 15. Get nostalgic. Do you have an old wooden wheelbarrow from your grandmother’s yard? Fill it with flowers and place it in the garden bed. Or how about a relative’s old wooden chair? Take out the seat and make it into a planter and paint it a color to match. 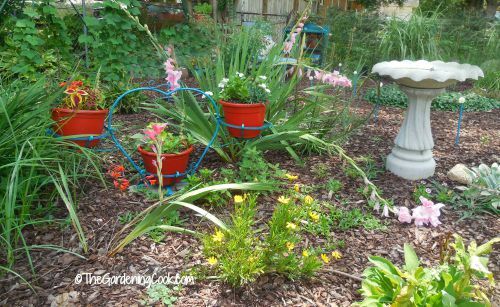 Repaint a favorite garden planter. A few nostalgic items here and there in a cottage garden adds a homey look to it. 16. Attract the Birds. 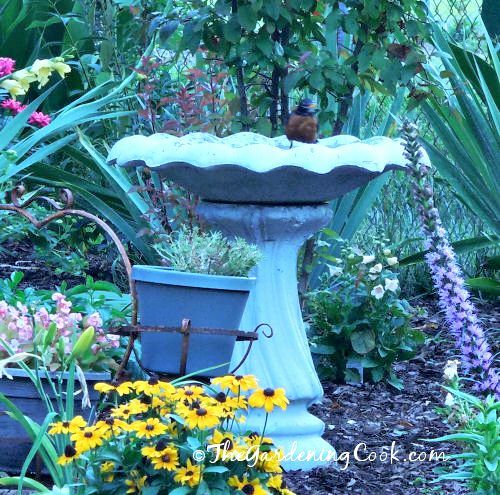 Well placed bird baths do a great job of attracting the birds to your garden. 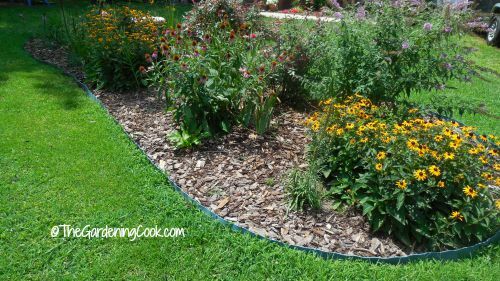 Be sure to also add plants that get seed heads, like sunflowers and cone flowers too. The birds love them all season long. Hummingbird feeders also bring the hummers in droves. 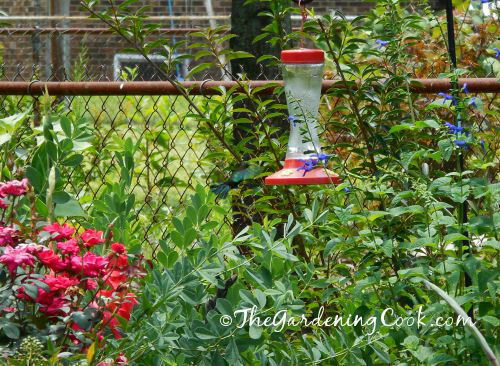 Keep them clean and make your own nectar to feed the hummingbirds too. 17. Don’t forget the butterflies. 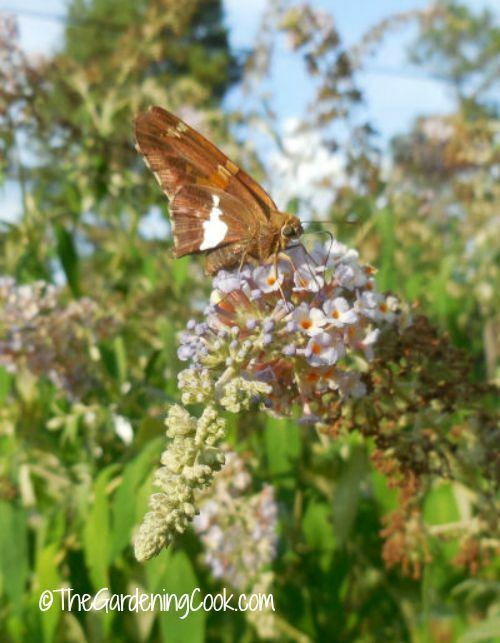 There is nothing like sitting in a garden bench watching the butterflies feed on a free flowing butterfly bush. Be sure to plant milkweed, butterfly weed, salvia and other plants the butterflies love. Doing this will attract the bees too. Note: Some of the photos used above (those not watermarked or attributed to source) are public domain images from Pixabay. See more photo sharing sites here. Do you have some tips for creating a cottage garden look that you would like to share? Please leave your comments below.